Nelson and Colne College celebrated National Apprenticeship Week and National Careers Week with a trip to Parliament, a “Back to the Floor” visit with the Principal and a Guinness World Record attempt. The College, which is number one in the country for its work with apprentices aged 16-18, joined hundreds of educations providers, employers and students nationally in celebrating Apprenticeships and Traineeships and the positive impact they have on individuals, businesses and the wider economy. 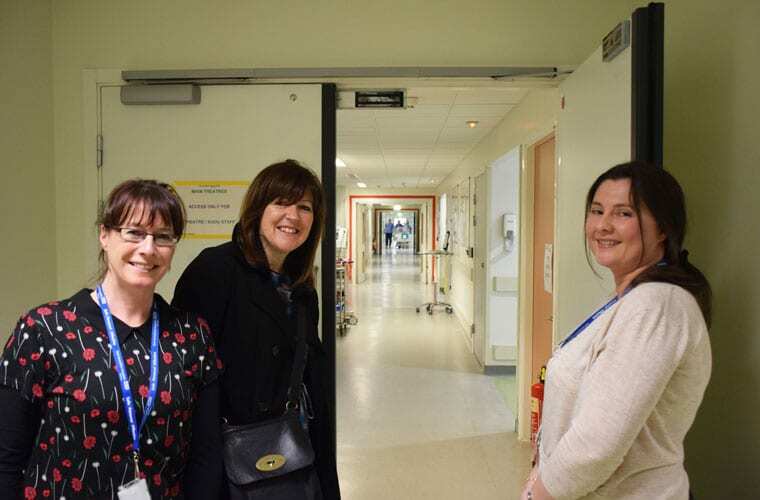 As part of the celebrations, Principal Amanda Melton visited the Royal Blackburn Hospital on a “Back to the Floor” opportunity to meet apprentices in the East Lancashire Hospitals NHS Trust. Former Business and Administration Apprentice and current member of NCC’s Business Development Team, Aaron Hamilton, was also out and about as one of 100 Apprentice Ambassadors visiting the House of Commons where he met Robert Halfon MP, the Minister for Apprenticeships and Skills. Amanda said: “It was so interesting to visit the ELHT and meet our apprentices and the managers who will be channelling talent into the organisation in the years to come. There are so many opportunities for students, adults and for employees of the Trust to upskill and move through their professional life. One of the apprentices Amanda met was Adam Greenwood, a former NCC student who left College with a triple distinction in IT. Adam is now doing a Level 2 NVQ in Customer Service, alongside his work in the hospital post room and a six week stint in the ELHT’s IT department. 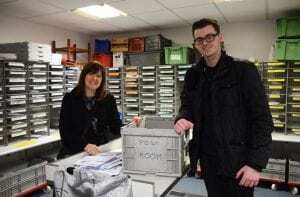 Adam said: “I jumped at the chance to get a job within the NHS because I saw it as a really good organisation. “It has allowed me to move my career forward in whatever way, including a chance to get into IT. On his visit to London, Aaron said: “It was a great experience to represent both the College and the county with the Lancashire Young Apprentice Ambassador Network. I met Mr Halfon and I shared my Apprenticeship journey with him, explaining how Nelson and Colne College have got me where I am today. Also during National Apprenticeship week at NCC, there were drop-in advice sessions, an Apprenticeship Advice Hub with “sign up” opportunities for Apprenticeship applicants and free employer advice on the Apprenticeship Levy. With the theme of this year’s National Apprenticeship Week being the “Ladder of Opportunity”, new Apprenticeship videos were also launched via the College’s social media channels, reflecting apprentices in various sectors and at different stages on that ladder. 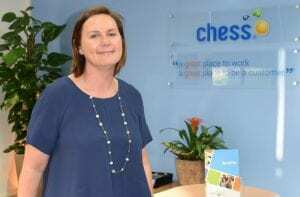 One of those is Sara Wil son, Finance Director at Chess ICT in Burnley, who is undertaking an NVQ Level 5 in Leadership and Management. She said: “I have really enjoyed it. Working in an SME business, it has been really good to have access to a mentor. Barbara at the College has been really supportive, talking about things from both a personal and professional point of view. She has encouraged me, given me a sense of belief and confidence and the feedback on assignments has been great. 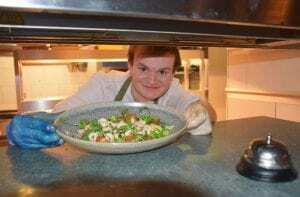 “I’m a really keen advocate of Apprenticeships. If you can get on the job training supported by relevant theory, I think that is a win-win. We are giving people valuable work experience, upping their skills and knowledge and I think as an employer it is only the right thing to do. Assembly”, a live video stream to thousands across the UK wanting to find out more about Apprenticeships and career options post 16, with the aim of making it the biggest careers advice seminar ever. NCC students were also offered the chance to speak to employers and explore careers in both the public and private sector, seek advice for the future from the NCC+ Career Zone, and visit a HE Convention in the sports hall where representatives from several universities set up to talk to students. Francesca said: “The s eminar had a particular focus on Apprenticeships and demonstrated they are a fantastic option for people who want to learn in a ‘hands on’ way and enter the world of work while gaining a qualification at the same time. “It was great to hear so many students and employers talking positively about their experiences and the benefits to the business. NCC is first in the country for its Apprenticeship work with 16 to 18-year-olds also second nationally for its overall Apprenticeship provision. The College is also top in the area for employer satisfaction. Highlights the College’s offering include its unique talent matching service and training analysis, its pre-Apprenticeship support and its tailor made approach to upskilling employees and succession planning.